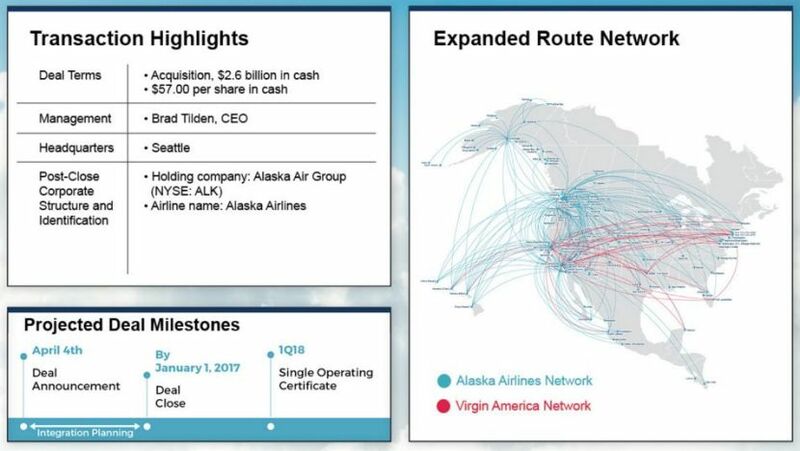 Assuming regulator approval, Virgin America will be property of Alaska Airlines by this time next year. The merger is expected to close by January 1, 2017, though Virgin will continue to operate separately until the airlines receive a single operating certificate sometime in the first quarter of 2018. Brad Tilden, Alaska’s current CEO, will remain in charge following the merger. The company will maintain its headquarters in Seattle. Alaska digs into this a bit on the website it created to promote the deal, but as you might imagine, it boils down to “bigger is better,” with the deal positioning Alaska to compete with American, Delta, United and Southwest. After the merger is complete (and based on current routes), the two airlines will serve 114 destinations in four countries, including the United States, Canada, Mexico and Costa Rica. With passenger numbers combined, Alaska will become the fifth largest airline in the US, unseating JetBlue, which currently holds that slot. The two airlines will serve a total of 39 million passengers between 1,200 daily departures. The fleets will be combined, which means Alaska will operate a total of more than 280 aircraft, made up of both Airbus A320s (from Virgin) and Boeing 737s (from Alaska’s current fleet). Additionally, once the deal is complete, Alaska expects $225 million in “synergies.” That essentially means the airline expects to save $225 million by eliminating redundancies, be that in vendor agreements, office space or, unfortunately, employees. 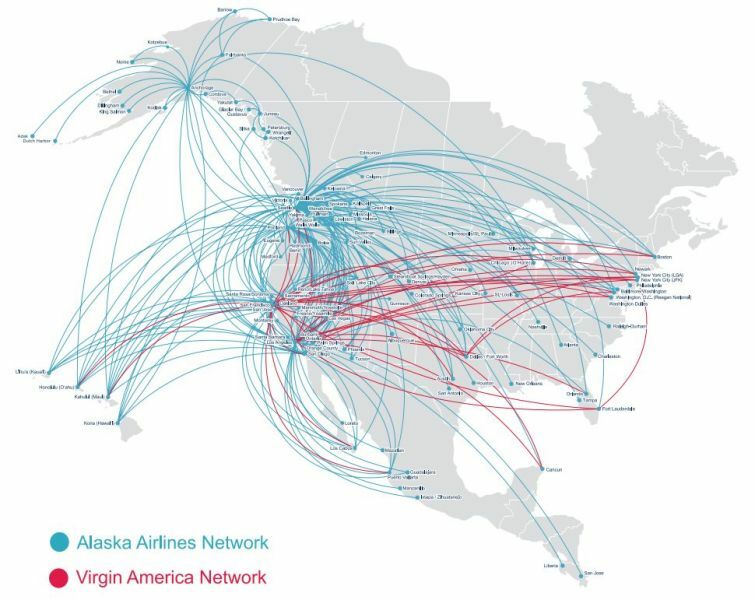 As you can see above, there’s not much overlap when it comes to the route map — Alaska will be gaining all of Virgin America’s routes and airport slots, though it’ll likely be able to maintain most of its own as well. Interestingly, Alaska has already confirmed plans to not raise airfares in the Q&A it published today, saying “Alaska Airlines and Virgin America are both known for excellent service and fares that are lower than legacy carriers, and we expect to keep them that way.” That seems a bit premature, but it’s somewhat reassuring, I suppose. Virgin America and Alaska are two great airlines that consistently deliver low fares and an outstanding customer experience. By bringing them together, we’re creating the premier airline for people who live anywhere on the West Coast. The merger of Mileage Plan and Elevate won’t be quite as straightforward as it may have been for American/US Airways and United/Continental, since Mileage Plan is a zone-based program with distance-based mileage earning and Elevate is a revenue-based program both when it comes to earning and redeeming miles. Both loyalty programs will remain distinct until the transaction closes – with no short-term impact on members. All Alaska Airlines and Virgin America loyalty program members are able to earn and use points and miles as usual during this transition. In the future, the programs will be merged and we look forward to welcoming Virgin America Elevate loyalty program members into our award-winning Mileage Plan, ranked #1 by U.S. News and World Report. Loyalty points accrued in Elevate during the transition period will be transferred and honored. We are committed to ensuring that loyalty members of both programs will maintain the same high-value rewards they’ve come to enjoy in both programs – with access to an even larger network. Of course, it’s too early to say how Alaska will value each Elevate point. Currently, we value Alaska miles at 2 cents each (though that’s expected to drop later this month, following the Emirates devaluation) and Virgin America points at a minimum of 1.5 cents each. If points are combined at a 1:1 ratio, Virgin America customers will likely come out ahead, especially due to Alaska’s strong partnerships with international carriers. Assuming partnerships remain intact, Virgin America customers will be able to redeem for Cathay Pacific first class. As for co-branded credit cards, Alaska has already confirmed that it plans to stick with its existing product, the Alaska Airlines Visa Signature credit card. Current Virgin America cardholders may automatically receive either a new card from current issuers or a similar product from Bank of America, but that remains to be seen. Since Alaska and Virgin America are both relatively small airlines (compared to AA, Delta and United), this merger isn’t quite as concerning as some of those we’ve seen in the past. While it does mean less competition, particularly at key airports on the West Coast, Alaska has committed to maintaining low airfares. The team at Virgin America have built an incredible airline, and we’re going to do our best to honor what they built and to seamlessly integrate the two companies, to provide an even better experience for our customers. As for the loyalty programs, there are definitely key advantages for Virgin America customers, who stand to gain international redemption options and superior elite benefits. Sudden devaluations aside, Alaska Mileage Plan is a very solid program — we can only helps it stays that way.